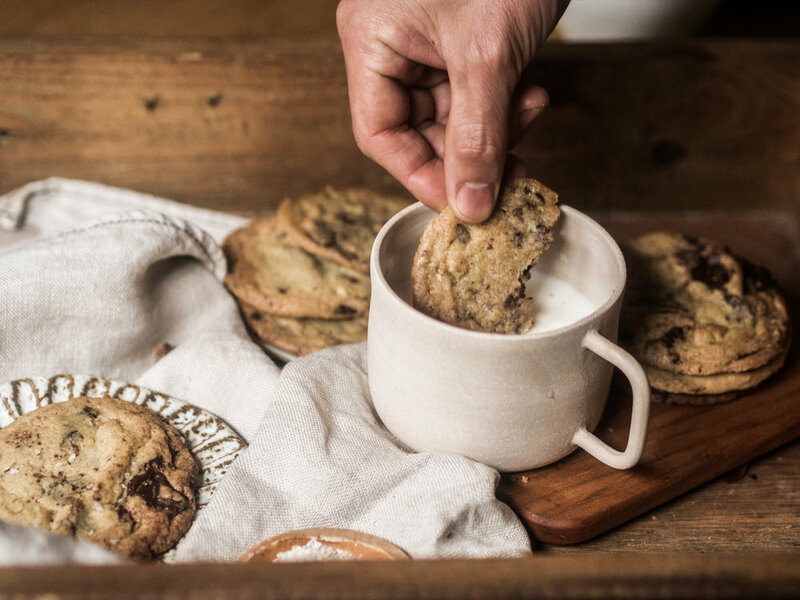 There is something supremely comforting about sitting at home on a Saturday night, curled up with a warm drink and some just-out-of-the-oven choc chip cookies. You would think it's a winter scene, but alas, Melbourne summer has begun with a heatwave and well now, it's very very stormy. In fact, I actually should have been at the wonderful Taste of Melbourne Festival hosting an event, but as I mentioned, it's been quite an intense few days of weather and the event was sadly cancelled. Now on to these cookies – they're slightly chewy in the middle, a little crunchy on the edges. That's just how I like them but you can actually bring them out from the oven a minute or two earlier for chewy all over if that's your thing. I've made them with a little rye flour before too, just replacing half of the white flour, which gives them a nice texture too. Feel free to swap out the walnuts for hazelnuts or almonds or leave them out entirely. In a large bowl, cream the butter and sugars until pale and very fluffy. Add in the egg and vanilla and mix well. Stir through the flour, baking powder and salt and gently combine until everything is well incorporated but being careful not to over-mix. Now add in the dark chocolate and walnuts and combine. Cover the bowl and chill in the fridge for 30 minutes to an hour. Preheat an oven to 180C and line four trays with baking paper. Place heaped tablespoons of the dough onto the trays, leaving room for them to spread. If you only have one or two trays, keep the dough in the fridge while each batch is cooking and then repeat the process once you have a free tray. Bake in the preheated oven for 12-14 minutes or until lightly golden. Allow to cool before transferring from the trays. Serve with cold milk and extra sea salt.